Germany is about to start a new phase in its energy revolution with a project that is meant to use captured carbon dioxide, use solar and wind power to produce hydrogen from water, and combine all of them to produce natural gas, aka methane. The project, named “Power to Gas” (P2G), aims to use the country’s huge renewable energy production to produce natural gas – it’s like an energy storage, if you like, but in a more traditional fashion. Theoretically, with the gas produced by the P2G system you’ll be able to travel with your gas-powered car cleaner than if you would travel in an electric vehicle. The carbon dioxide your car produces will be the same carbon that a sequestration plant takes somewhere else, at the same pace. 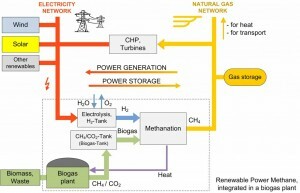 But Power to Gas is only meant to be used as a renewable energy storage, at least for the beginning. The P2G project will start in 2014 and will involve Etogas, Juwi Technologies, the Centre for Solar Energy and Hydrogen Research (ZSW), the Reiner Lemoine Institute, and RWE Germany. A test facility will be built in Morbach im Hunsrück, in Rhineland-Palatinate, and will operate in real-world conditions, providing backup capacity for gas-powered stations. The advantage is that the infrastructure to use the gas is already there, giving the system a higher flexibility.